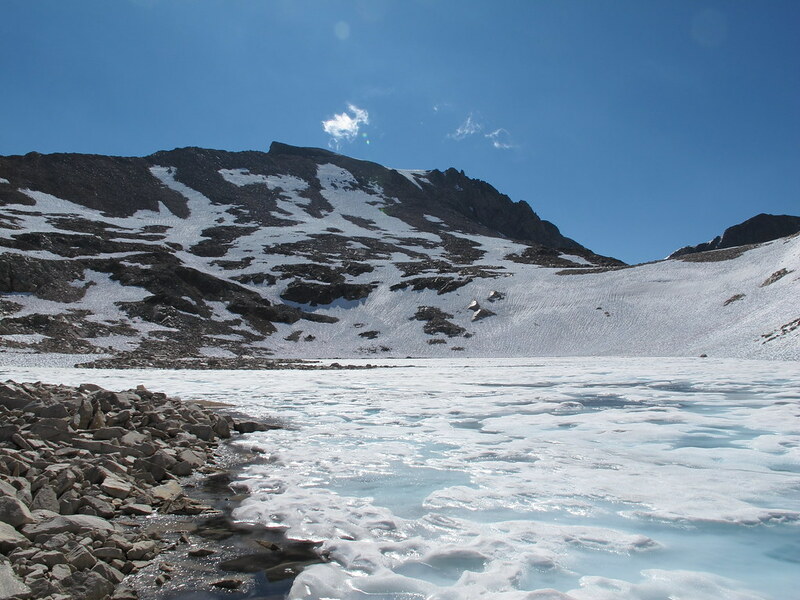 GENERAL OVERVIEW: This pass leads from the Helen Lake basin east of Muir Pass to Lake 11,828 at the far eastern end of the Ionian Basin. CLASS/DIFFICULTY: Class 2, but with significant boulder-hopping, loose rock, and route-finding challenges on the south side of the pass. LOCATION: Kings Canyon National Park. ROUTE DESCRIPTION: The north side of the pass is the easier side. Head south from Helen Lake or Muir Pass to Lake 11,939. It appears that the specific route doesn’t matter, just picks what works. There is a hill near the north side of Lake 11,939, but it flattens before the shore and doesn’t come into play. The pass is the obvious saddle on the south side of the lake. Walk around the east side of the lake toward the saddle. There is a meadow on the lake at the eastern (left) end of the saddle. This is your mark to go up. Right above the meadow are a couple of rocky ridges. Walk between and on the ridges to avoid the talus to the sides. When you get near the top of the ridges, start traversing to the right (west) to get to the low point of the saddle. Going straight up the middle of the saddle may work, but it’s lots of talus. There may be a band of snow below the top of the pass, but it appeared that was a detriment rather than a help. In early season or a heavy snow year, climbing up snow, especially on and between the ridges, is likely the way to go. Going north from the pass, head right into the ridges. Don’t go to the right of the ridges, however. There should be visible use trails. The south side of the pass is a challenge. The rock is varied. The granite is fine, the black shale can be loose, but the orange rock is loose, uneven, and maybe even dangerous. Unfortunately, the use trail goes through the orange rock by necessity. The good news is that there is a use trail that is not too hard to pick out. Just take your time. Coming north up this side of the pass, target the orange rock to the right to find the use trail. Once down the main portion of the pass, you have to cross a low ridge of big blocks to get to Lake 11,828. There was no obvious route through there. Around the lake, stick close to shore. Last edited by ERIC on Mon Aug 06, 2012 7:34 am, edited 1 time in total.